Dyson recently launched the Pure Cool Link, a fan that looks and functions similarly to the company's previous line of high-end oscillating personal air controlling devices, but now with the added bonus of cleaning the air in a home (via The Guardian). Thanks to its HEPA filter, the Pure Cool Link promises to remove 99.97% of particles as minuscule as 0.3 microns, so potentially hazardous pollutants like pollen, bacteria, mold, Asbestos, odors, tobacco smoke and even carbon dust can all be successfully captured. 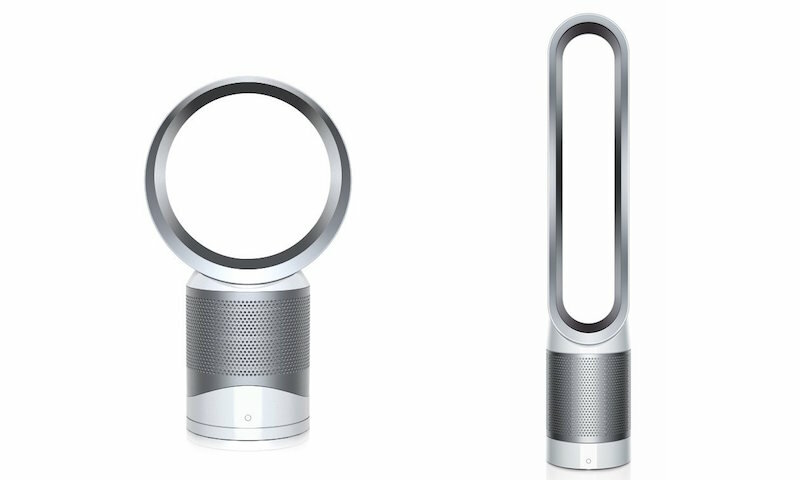 The company is also integrating its connected smartphone app, Dyson Link, into its new Pure Cool Link fan, which marks the first time one of its fans will be able to be controlled through an app. The experience will let users monitor both indoor and outdoor air quality, and even let them set the connected device to automatically clean a room whenever the standards for clean air drop below a certain mark. The Dyson Link app was previously supported as a connected accessory to the Dyson 360 Eye robotic vacuum cleaner. Beyond air quality monitoring, the app gives users a suite of basic remote control functionality to the Pure Cool Link while displaced from it, including: a scheduling system, manual on/off controls, temperature and humidity numbers, and a complete history of the air quality levels in a room. It can also give users an updated reminder of the filter life inside of the Pure Cool Link, so they can be warned ahead of time when it needs to be changed. Other features of the Pure Cool Link include a "night-time mode" that turns down the audible noise disturbance of the fan and dims the display, for users who want to keep its features running through night hours. Although the fan isn't directly billed as a personal air condition device like Dyson's other products, the Pure Cool Link can sense when it is a warmer day, automatically helping to drop the temperature within the room a few degrees "with smooth, long-range air flow." 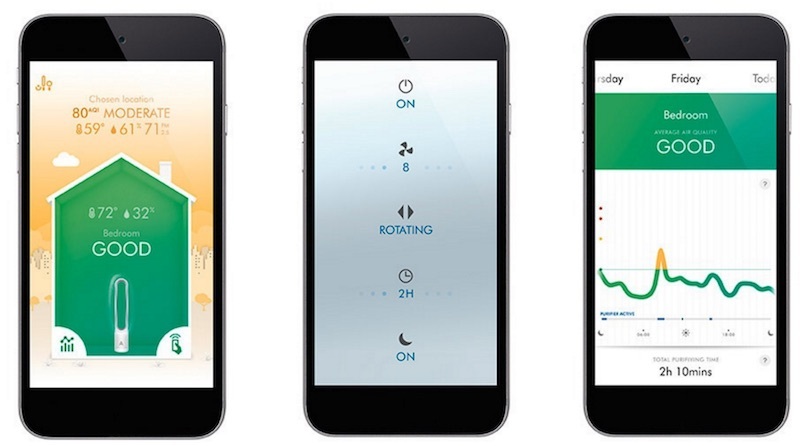 The range of connected Dyson devices is limited to the Pure Cool Link system, but the company is expected to continue to expand these smartphone app connectivity features to its other products in the future. At launch, the new Pure Cool Link system does not integrate with Apple's HomeKit platform. Those interested can purchase the Dyson Pure Cool Link tower for $499.99 from the company's website, in either blue or white. There is also a smaller desktop version of the new air quality-controlling fan, but it appears to currently not be available to purchase from Dyson's United States store. If abiding by the pricing tiers of previous Dyson products, the desk fan version of the Pure Cool Link would be $100 less and come in at $399.99. $500 and no HomeKit? Pass. My thoughts exactly. They couldn't even integrate that with the ridiculous price tag? I've always wanted one of these fans but can never justify the price. Some smart features (especially Homekit) and a price reduction and I might consider it. No problem, Dyson sells a $600 vacuum cleaner that will take care of that. We have two Dyson vacuums: one is more than 13 years old and the other one is around 8. Both function as new. 1) Not an April Fool's joke. It is a real product ('http://www.dyson.com/air-treatment/purifiers/dyson-pure-cool-link/dyson-pure-cool-link-tower-white-silver.aspx') on the Dyson site. 2) The HEPA filter is expected to last 12 months if the device is run 12 hours per day. But Dyson hasn't posted the cost of replacement filters. That could be the real deal killer. I run my Austin Air HEPA units (4 of them) 24/7 and have done so for more than 10 years. The filters are effective for 2 to 4 years depending on conditions. If I ran the Dyson 24/7 I'd be replacing the filter every 6 months, and possibly more frequently if they aren't rated for the volume of air I currently exchange. So the total cost of operating a Dyson looks like it could be considerably more than effective alternatives. Pretty every product post here just has the usual subjects in the comments moaning about how its too expensive, doesn't do this A or B, won't be buying because of... blah blah blah. There really are some right negative knuts in this place. Although the fan isn't directly billed as a personal air condition device like Dyson's other products, the Pure Cool Link can sense when it is a warmer day, automatically helping to drop the temperature within the room a few degrees "with smooth, long-range air flow." This is of course complete nonsense, a fan is NOT an air conditioner as in it cools the air like real air conditioners do. It's also nonsense that a fan can cool a room if there is no connection (tube or so) to another room or the outside air. A Fan only displaces air, it cools you down but the air itself is of the same temperature as the surrounding air. Hope that this one is more quiet. I bought an earlier version and the fan was too loud even at the lowest setting. I don't mind paying for nice things, but I do expect them to function flawlessly. I really like these fans, BUT, in my eyes they are way overpriced, if dyson would sell them for around $100 they would sell millions and make more profit. The joke is its a real product.